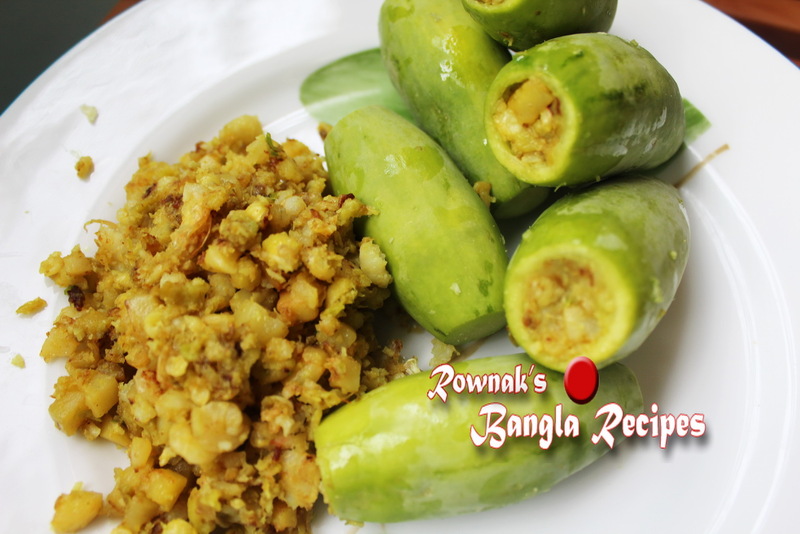 Potoler Dolma / Stuffed Pointed Gourd has few versions (traditionally with small prawn, vegetarian one with chick peas or cheese and mutton). I am giving here prawn but if you want you can make your choice one. For prawn I use coconut paste which one can skip for mutton and add ginger in it. I havnt used onion in this recipe, if you are not comfortable with skipping onion, you can add onion in stuffing and gravy. But please try my version (you will love). Enjoy. Wash, scrape the potols skin and cut off the tips from both ends. Scoop out the seeds from one end without breaking/damaging the other end (I use the handle of a teaspoon to do this). Keep the seeds to use in stuffing (dont keep mature seeds, we only use soft seeds). Rub a little salt on the inside and outside of the potols and keep them aside for 10 minutes. Heat 1 tablespoon oil in a fry pan/ kadhai, when oil is ready, add diced potato, turmeric and ½ teaspoon salt. Fry for 3-4 minutes. Add coconut paste, poppy seed paste, green chili paste and saute for 2 minutes before adding prawn and potol seeds. Add prawn and seeds ; cook it till potato becomes tender. Let it cools down and coarsely mash it. Make batter thick with flour to seal potol. Stuff each potol with stuffing, dip the open end of potol in batter and fry in oil for 2-3 minutes. In same pan heat rest of oil and add chopped garlic, cardamom and cinnamon. Saute for minute. Add turmeric, coconut paste, chilli paste, poppy seed paste, 1 tablespoon water and salt. Cook till oil is separated. Add water and let it come to boil. Add stuffed Heat up the remaining oil in a kadhai/wok. Add in the bay leaves, onion paste and ginger paste. Fry very well, add red chili powder and turmeric. Mix and sauté for a couple of minutes. Add water and let it come to a boil. After a couple of minutes, add in the stuffed potols, sugar and raisin. Let it simmer on low heat till gravy thicken. Add ghee before remove from heat. 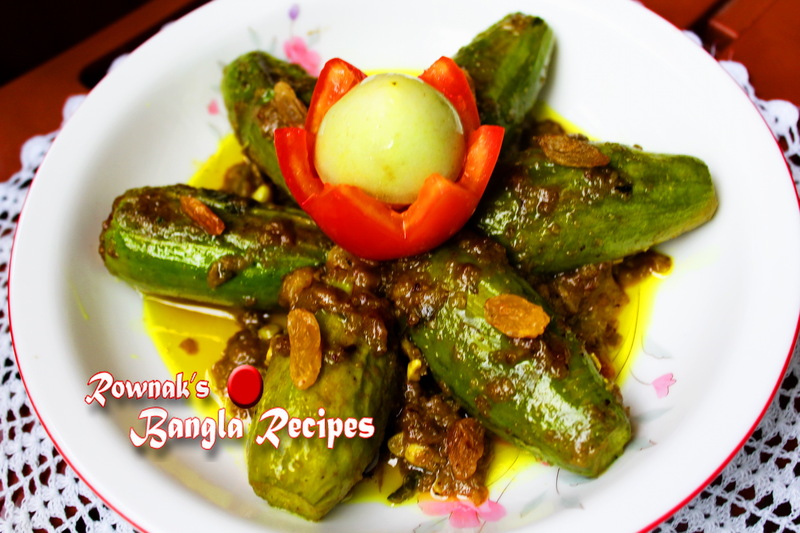 Serve Potoler Dolma / Stuffed Pointed Gourd with plain rice or pulao. If you want, you can stuff potols after frying potol. Just a quick question did you use fresh potol? Does frozen potol work as same? 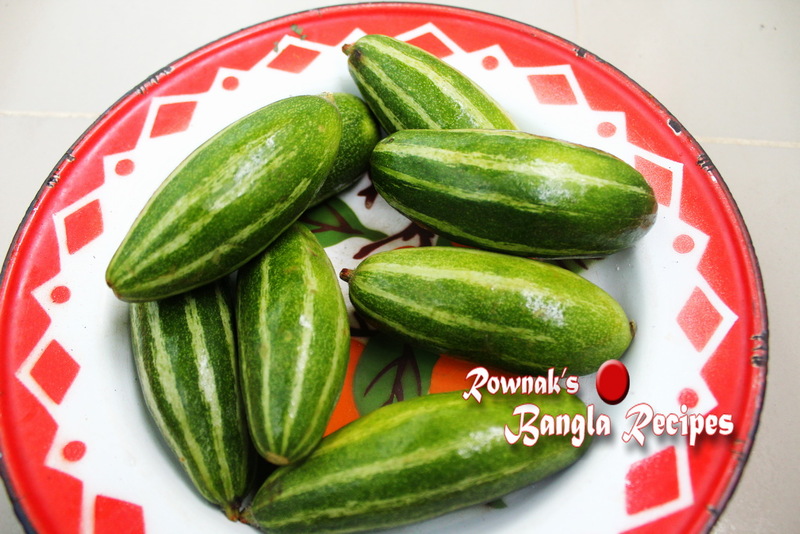 Thanks a lot for your reply.Not sure where I can get the fresh one.But I’ll try with lebanese zucchini. Zucchini will be great idea . please let me know your outcome .